To those few of you who read this blog somewhat regularly – many thanks for putting up with my incoherent rambling. I tried to make a point or two, but I was fully aware that for the most part, it was a waste of my time. I hope the occasional humor kept it from being a waste of yours as well. To my guilds, both past and <Sword of Azeroth>. Thank you for letting me get in the joy of raiding. Trust me, you’ll be better off to find a hunter of some quality – and one who doesn’t crack so many Firefly references. My fellow bloggers – thanks for your input, and your ideas. Couldn’t have made it as far as I did without you. Same to the wonderful podcast community – you made my commutes much more bearable – don’t know how I’m going to make it through the roughly 15 hours a week in the car now. I regret never finishing a tier set – like so much else in my life, it will remain a bitter reminder of what I wanteed to accomplish. I regret not being able to finish the journey with Bullheaded – my friends in <Shadow Rising> were most accomodating to allowing a true-blooded Alliance player come experiment on the dark side. So, from Rustbeard, Blackrune, Shepard Book, Blackbeard, Cloudshadow, Big Crawdaddy, Semira, Nightmoss, and Bullheaded, I wish you a very fond farewell. 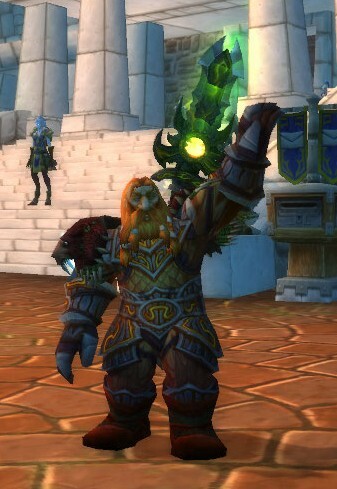 Ed was once a former dwarf hunter in World of Warcraft. Of all the things he will miss, the greatest will be the friendships he formed in the game. The lonely sentinel blends into the trees and plants, watching for signs of evil in the forest. Green Dragonscale Leggings – Note that the pattern for this is no longer available. Seek an old-time leatherworker. When you’re juggling a job that with the commute consumes 60 hours a week, raising a teenage daughter who’s involved in sports, having a main that raids 3 nights a week, get some blog posts written, and the occasional tropical storm; it’s somewhat difficult to run the normal stable of alts that I’m used to.Time and resource management is key, both in daily life, and your WoW time. I’ve captured a couple of the major themes I use below, and will perhaps go into it more in the future. One of the first methods I use in leveling is the “Alt day” concept. The key to leveling alts quickly is a combination of heirloom gear and rested XP. Since rested XP generates at a single segment every 8 hours, I can get the full 20 segment bar done by resting By running a particular alt only once a week, it can be sitting in an inn or capital city, soaking up rested XP, and have nearly a full bar each time I trot them out. Also, having a continuous time to play prevents running back and forth to inns/capitals and allows a more productive use of time. The goblins say that “time is money, friend.” In math terms, time = money. And just like in math, that equation flows both ways. Using money to keep your alts in the best gear during the leveling process isn’t nearly as difficult as it used to be, given the amount of heirloom gear available. Once you hit 80, however, having some new greens that are in abundance in the auction house should help prevent a few corpse runs. If you have crafters in your stable, use them – you’re more likely to have cutting edge gear supplied by an alt than crafted yourself given the current rate of crafting vs rate of leveling. I’ve found it easier to leave the upgrades for the next 10-15 levels in my mailbox. Then, when I visit a class trainer, I hit the mailbox and load up on all the items that the character will be eligible for until the next level that requires a trainer visit. In between alt days, my main or other alts will craft/buy the gear/create enchants for the next 10-15 levels. Tropical Storm Lee is beating down on Little Blue Dog central. Combined with the incoming rain, the usual windstorm that accompanies my daughter’s birthday and family visits, I don’t expect to find much time to put another post together until Tuesday at the earliest. So, for those wishing to provide symbolic help, please stand in Menethil Harbor during a rainstorm and bemoan the flooded streets. Those wishing to provide more substantial help might donate an extremely large fan or two so we can blow this storm over to Texas, who would welcome the 10-20” of rain we’re expected to get. 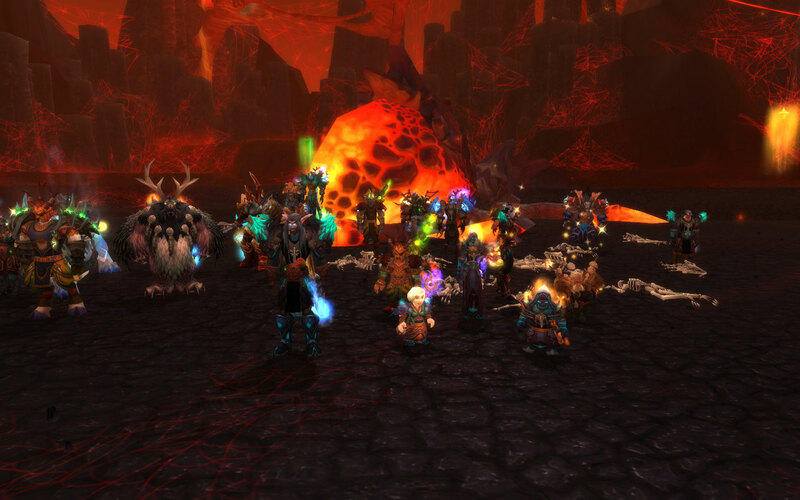 From the >Sword of Azeroth> first 25-man Beth kill. 15 worthless bonus points to the first person to name the reference below.